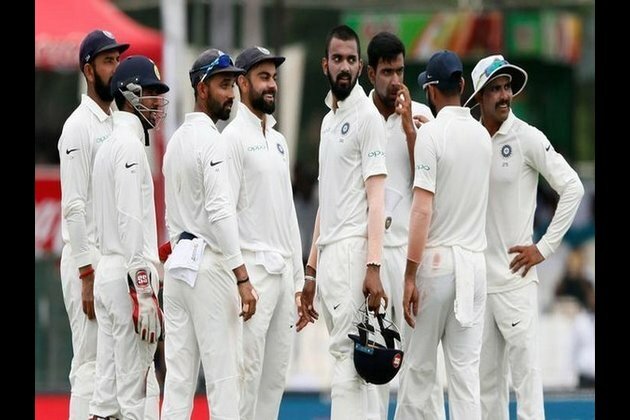 Hyderabad (Telangana) [India], Oct 12 (ANI): India restricted the West Indies side at the total of 295/7 by the end of Day One of the ongoing second Test here at Rajiv Gandhi International Stadium on Friday. Opting to bat first, West Indies accumulated 32 runs for the first wicket with their openers, Kraigg Brathwaite and Kieran Powell, contributing scores of 10 and 22, respectively. After adding four more runs to his individual total, another Caribbean opener, Braithwaite, fell to an absolute beauty from Chinaman Kuldeep Yadav and departed at the score 14 runs. After the dismissal of Hope, Kuldeep Yadav struck again as he sent Hetmyer (12) and right-hand batsman Sunil Ambris (18) back to the pavilion. Just when West Indies started to lose their way, all-rounder Roston Chase, along with right-hand batsman Shane Dowrich, built a crucial 69-run partnership driving their side out of the danger zone. It was Chinaman Kuldeep Yadav, again, who came to India's rescue and caught Dowrich (30) in front of the wickets. After Dowrich's fall, West Indies skipper Jason Holder walked to the crease and added 104 runs to the team's total along with, already set, Roston Chase. At the time when Holder and Chase seemed to be in the total control of the session, the skipper edged a quicker from Umesh Yadav and went back to the pavilion giving India a breakthrough just before the end of Day One.